“Whereas immediately following, you will begin the film…,” reads a typed standardize form containing, in laughably stiff legal jargon, the opening credits of Death of a Bureaucrat. 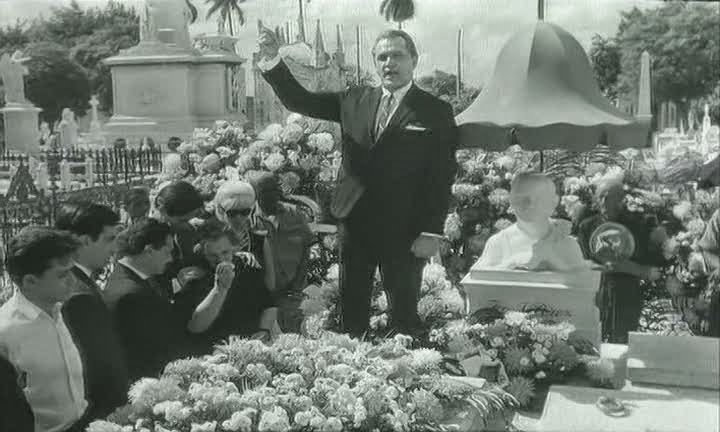 The film proper opens with a funeral for Paco, a sculptor and ‘proletariat hero’ who invented a machine for churning out busts of Cuban icon Jose Marti. So much was his work ethic admired that his family symbolically buries him with his work card, only to discover directly after that his widow needs it to apply for a pension. Paco’s nephew, our protagonist, must enter a nightmare labyrinth of bureaucracy to clear up the irregularity. Encountering endless technicalities that prevent him from exhuming the coffin, he resorts to an under-the-table arrangement with a trio of gravediggers, but once he recovers the necessary card runs into more paperwork trying to get the body reburied. All he needs is to get one more document stamped, but after waiting in line all day, the whistle blows and the worker on duty, his arm suspended in mid-air stamp in hand, grabs his coat and goes. Our hero stealthily stays behind to finish the job, but gets trapped in the office and has to sneak out on a ledge where he’s mistaken for a suicidal man (which isn’t far from the truth by this point). He eventually resorts to political pull, begging help from his powerful boss, Mr. Ramos, who runs a propaganda agency (think bulging biceps, capitalist octopi, etc.) currently designing a campaign touting the defeat of bureaucracy. Finally everything is in order, but the funeral director balks at burying a citizen already buried three days earlier. This is the straw that breaks the camel’s back. 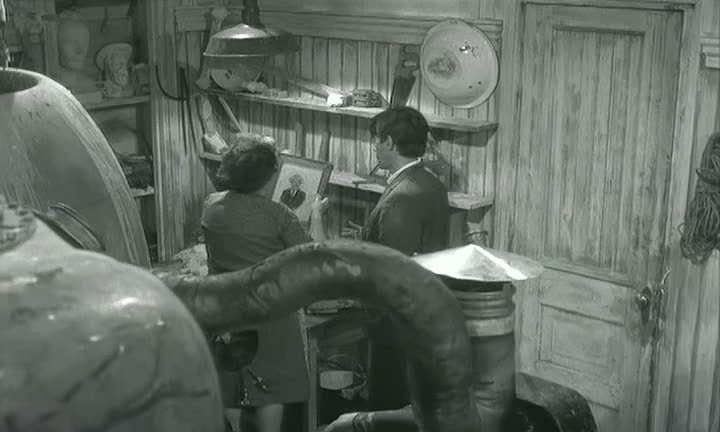 The film ends with another funeral, this time for the death of a bureaucrat. 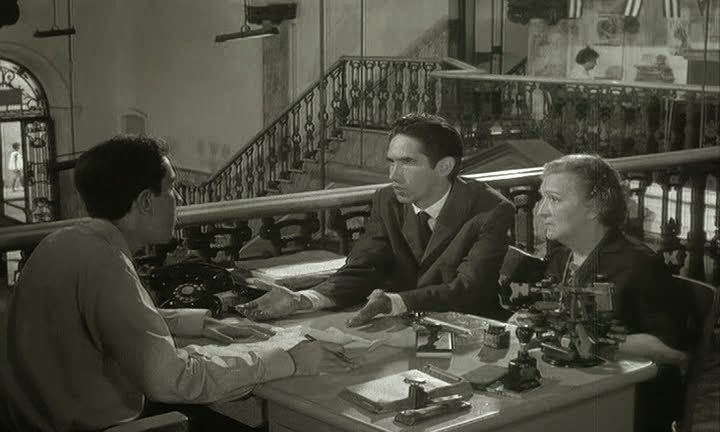 Not only a trenchant commentary on faceless bureaucracy and the petty men who hide behind it, Death of a Bureaucrat is also a darn funny film. Tomas Gutierrez Alea, Cuba’s most famous director, attacks bureaucracy on multiple fronts and while his salvos may lack coordination, his shots are rarely off the mark. In the film’s centerpiece scene the nephew bounces around a cavernous gallery of numbered desks trying to obtain the proper paperwork. Each functionary displays his own brand of office-bred obstructionism, but my favorite is a near-silent routine in which a bureaucrat slowly searches for a pen and fastidiously tears a strip of paper along a straight edge. In the background we can hear a man with small feet trying to acquire a dispensation for children’s shoes and an armless man being chastised for failing to sign a form. These details emphasize the film’s class conscious heart, showing how exception cases (the poor, illiterate, handicapped or just different) fall through the cracks while the rich and powerful bypass all trouble by ‘exercising influence’. We also see, of course, how large institutions are inevitably first in line to denounce waste, inefficiency and red tape without seeing the irony. Alea is clearly in love with film history and his film abounds with explicit references. A funeral parade traffic accident becomes an escalating exchange of mutual destruction straight out of Laurel and Hardy. Dream sequences parody imagery from Bunuel and Bergman. At one point the nephew finds himself hanging by a clock hand like Harold Lloyd. All the aforementioned are thanked by name in the film’s dedication, but I think Alea’s original material, combining serious, morbid subject matter with slapstick and satire, works best. Death of a Bureaucrat has itself influenced other works, most notably Terry Gilliam’s ‘Brazil’. 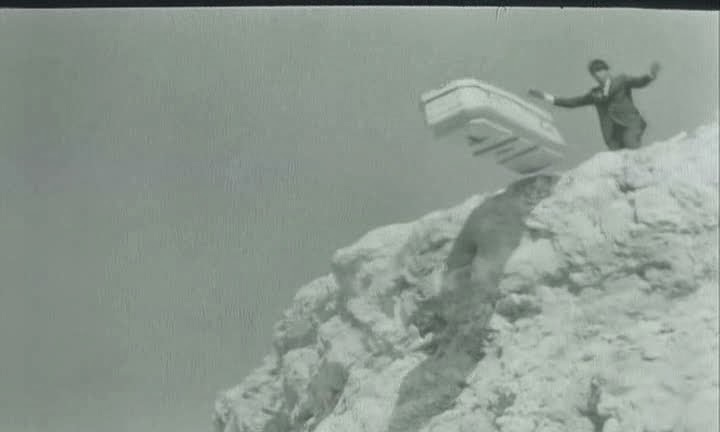 Alea’s use of low framerate cutout animation (in a notable sequence that serves as Paco’s eulogy) and other manipulations like fast forwarding through a rambling list of procedures became hallmarks of Monty Python.